Martinsville Speedway will light up their racing track for the first time after installing the Ephesus LED sports lighting system for this weekend’s historic NASCAR Late Model Stock Car race. This sports tech related achievement hits home as Hurricane Maria bares down on Puerto Rico after Hurricanes Irma and Harvey devastated the south especially in the Caribbean, the state of Florida and the Houston region causing death and massive power outages that are still ongoing. Here in Atlanta, my location lost power for 5 days. Power is out all over Mexico City after another earthquake rocked the country. Yet, the races must go on and in this case, because of state-of-the-art Eaton power management company products, drivers, fans, broadcasters and sponsors will all enjoy night competition under LED lights designed to increase illumination, give operators more control and flexibility, and be more sustainable than traditional metal halide lights. THE Sports Techie community blog believes in sustainability and using technology to make it so. This green project began in the Spring of 2017 and upon completion this Summer, granted track owners at the International Speedway Corporation (ISC), the eco-friendly privilege of becoming the first major motorsports facility to install LED lighting. The results enable over 75 of the best NASCAR Late Model Stock Car participants to drive their way to a coveted spot in the 40-car field of the ValleyStar Credit Union 300 for a chance to win $25,000 and take home the treasured Martinsville Speedway grandfather clock trophy. The two-day event starts with practice and pole qualifying heats on Friday afternoon and into the evening. Come Saturday, a full slate of activities is scheduled ending with the featured race at 8:00 p.m.
“Debuting our new LED lighting system at the ValleyStar Credit Union 300 is something that our entire staff and racing fans are excited for,” said Clay Campbell, president, Martinsville Speedway. Record breaking crowds are expected because of the first night race in the Speedway’s prestigious 70-year history. Advanced ticket sales, new ticketing options and luxury seating areas are also driving attendance up as are upgraded hospitality services and premier camping outings under the stars of Henry County in Ridgeway, Virginia. The implementation of the efficient lighting solution involves placing multiple structures strategically located around the perimeter of the facility and the infield of the track. An added benefit to enhancing the fan experience at Martinsville Speedway via the Eaton system is the increased quality of the broadcast for fans viewing at home. Fans using digital devices and apps will enjoy the LED lighting brightness. Graybar, a leading distributor of high-quality electrical and communications products and services, was the lead project management company ensuring the addition of Eaton’s Ephesus Stadium 750 light-emitting diode professional sports lights to Martinsville was seamless. Ephesus LED lights reduce power consumption by an average of 70% and maintain lighting quality with no maintenance. Sports Techie, NASCAR automotive racing is as American as apple pie or video gaming. Now, with the support of Eaton, ISC and Martinsville Speedway can be proud of the fact that they are using LED lighting to illuminate the race track in the evening for the ValleyStar Credit Union 300. Late model stock car racing is a throw-back into the past of sorts but with the Ephesus LED sports lighting system in place, racers and the fan experience are ready to step into modern day conditions. 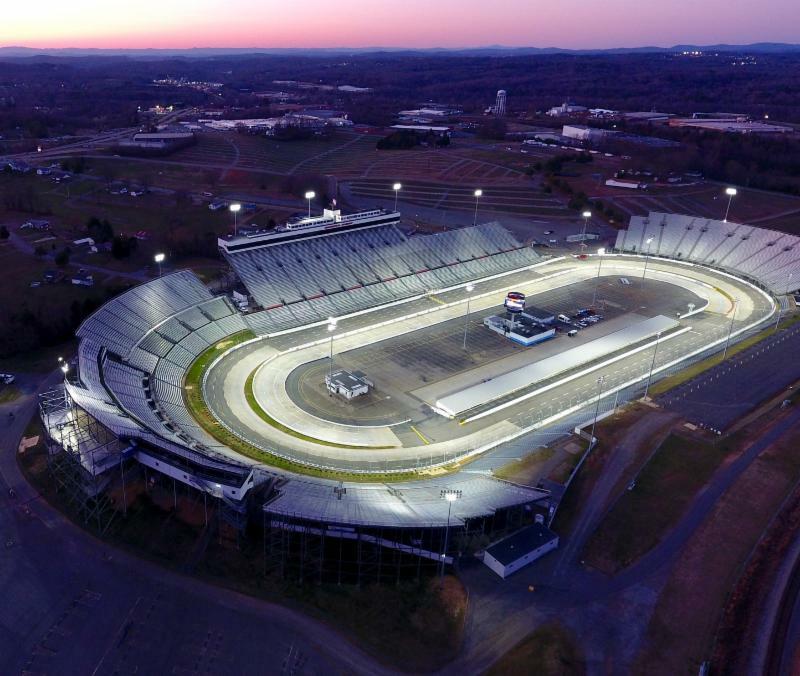 The future looks bright indeed at Martinsville Speedway thanks to Ephesus high-output solid-state sports lighting solutions manufactured by Eaton.